When this paramilitary ministerial vanity project announces plans to question “any individuals whose path we cross” you can be fairly sure they’re not lining up at the backpacker hostels. Many others have already written about yesterday’s events in Melbourne: see Subvertir’s experiences of the protest, the Buzzfeed article; or if you like news of the erosion of your civil liberties with a dash of mainstream media cred, check out the reporting by The Age or the ABC. The ensuing grassroots and media response embarrassed Victoria Police, in charge of the multi-agency operation, to the extent that they called off the whole exercise. Not one for self-awareness (see ‘Diversity’ example above), the ABF had also overstated its own part in the operation, leading to what must be some warmly welcomed professional development opportunities in the coming weeks. However, as Ede Eves reported, even after Operation Fortitude (I told you self-awareness was in short supply) was officially axed, City of Melbourne officers were asking “How long have you been in the country?” when accosting people for littering. None of the instances Eves witnessed involved white litterers targeted for questioning. It could be a coincidence (and indeed City of Melbourne was not announced as participating in Operation Fortitude in the first place). Maybe it’s standard practice to ask litterers what their visa status is. Maybe. Australians have been made afraid and apathetic by a steady creep to the inhumane in national security issues over several governments. This one is by far the worst, but Labor sold off its moral high ground on the matter a long time ago, now choosing instead to wait patiently in a values vacuum for the Abbott government to own goal itself out of a job. Good luck with that. We’ve all felt the mood in this country shift as a coldly calculated anxiety has settled in. The action in Melbourne is thrilling, for the fact that it happened in the first place, and that it worked. We are pushing back, a little – and a little late. 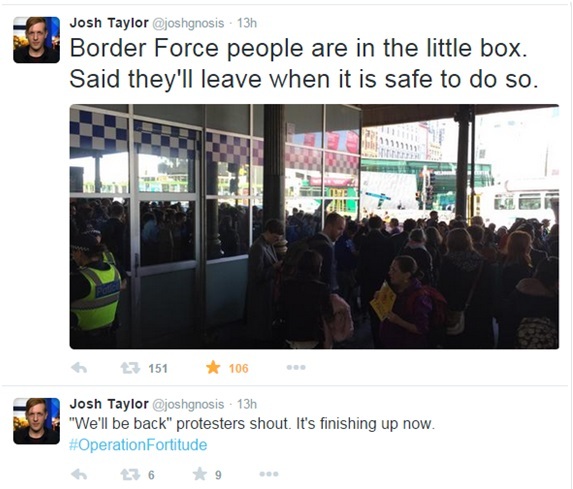 Not too late, hopefully, but what we did think was ridiculous (#BorderFarce, amirite?) is actually what this country has already accepted as the norm. 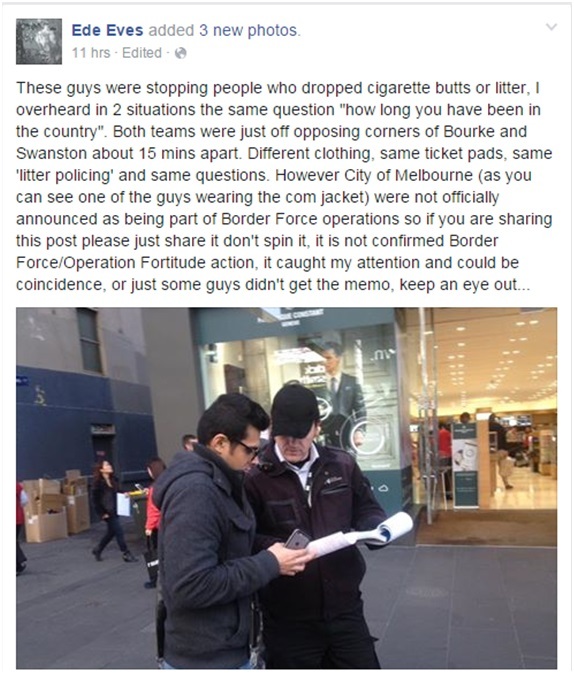 Those probably-non-Fortitude-litterwatch-officers will in all likelihood have been getting away with asking members of the public irrelevant, racially profiling questions for a while – and let’s not forget mass surveillance, or the immeasurably appalling things that happen in our detention centres on a daily basis. The test is whether we can resist those acts of “fortitude” that weren’t meant to have a hashtag in the first place, that were staged away from the city centres and press conferences; and force those into a little glass display cabinet of historical evil.